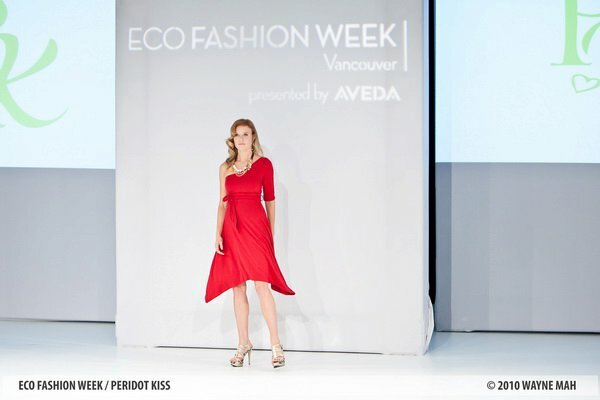 Red Jade designer Margarita Angelatos had twice as much reason to rejoice over her Eco Fashion Week successes last Wednesday. 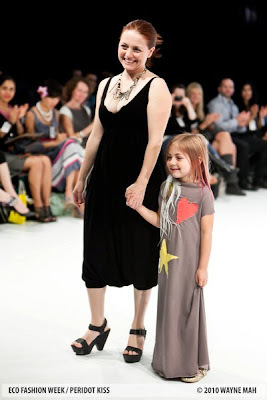 Not only was the collection for her established line a hit, she also showed a collection from her new line, Peridot Kiss. Peridot Kiss is being positioned as Red Jade's younger, more affordable sister brand which is focused primarily on hemp-based clothing. However, the quality and attention to detail that Red Jade fans have come to expect are still present in the new label's latest offerings. 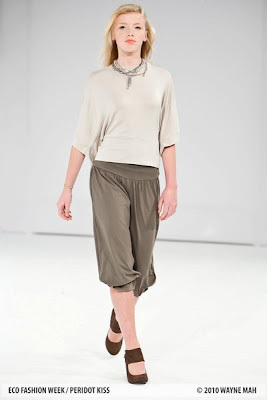 Silhouettes were relaxed, drapey, and artfully slouchy. Drawing on a colour palette of khaki and greige with dashes of red and yellow thrown in, the collection exuded a vibrant, confident mood. For me, the standout pieces in this collection were the dresses. The colour-blocked 3/4 sleeve loose dress with a drawstring drop-waist and the yellow tank dress with a bubble hem and low-slung pockets would integrate well with summer wardrobes. The red one-sleeve fit-and-flare jersey dress with an asymmetrical hem was stunning. Who knew eco-friendly clothing could be that glamorous? Speaking of glamorous, my favourite dress in this collection was an off-white hemp-based halter number reminiscent of the one Marilyn Monroe wore, except that the modest neckline, empire waist detailing, and flowing asymmetrical hemline on Angelatos's design make it a lot more sophisticated and chic. Angelatos and her daughter walked down the runway to enthusiastic applause. Congratulations on two great shows, Margarita! Ooo I do love those clothes! And I love that they are eco-friendly and glamorous (as you say ;). Thanks for sharing these, Lisa!